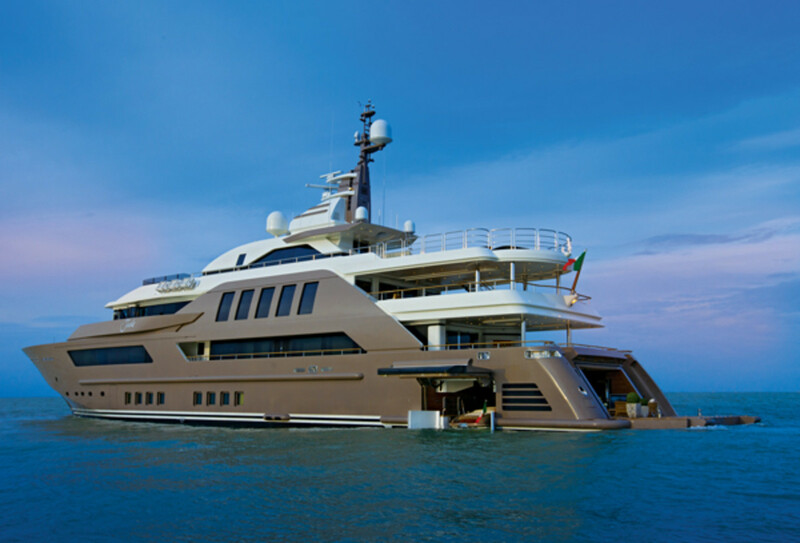 CRN’s J’Ade represents a milestone in the Italian yard’s evolution. I followed the construction of this yacht over the three years leading up to her launch. Shortly before she left the CRN shipyard in Ancona, Italy, for her maiden voyage, I was asked to get back on board and witness the fruits of the yard’s labor. 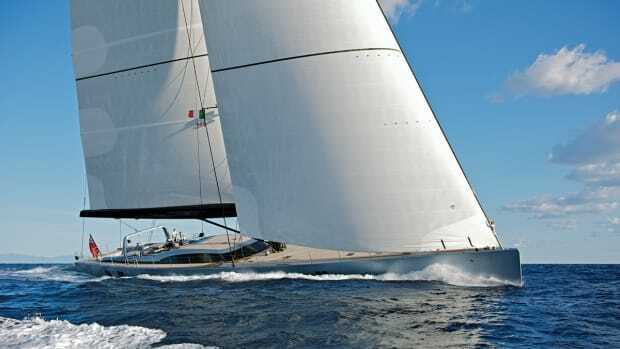 The result is well illustrated by Maurizio Paradisi’s photographs, but they cannot fully communicate the feeling I experienced when I stepped on board. The subdued atmosphere is warm and welcoming and has an elegant feel. The owners chose discreet hues, and the excellent quality of craftsmanship of all the furniture and fabrics has resulted in a finish that is exquisitely luxurious, yet comfortable and easy. 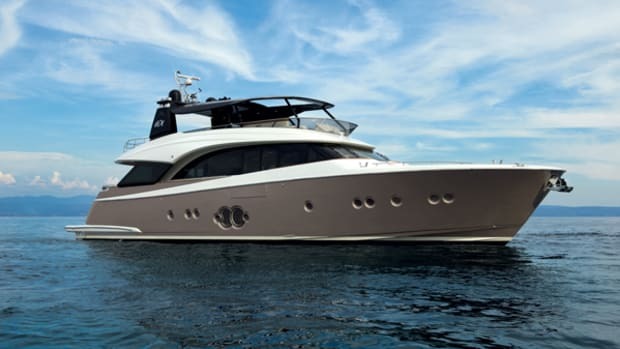 J’Ade’s origins trace back to Ferretti Group founder and chairman Norberto Ferretti, who wanted to build a 190-footer for himself. 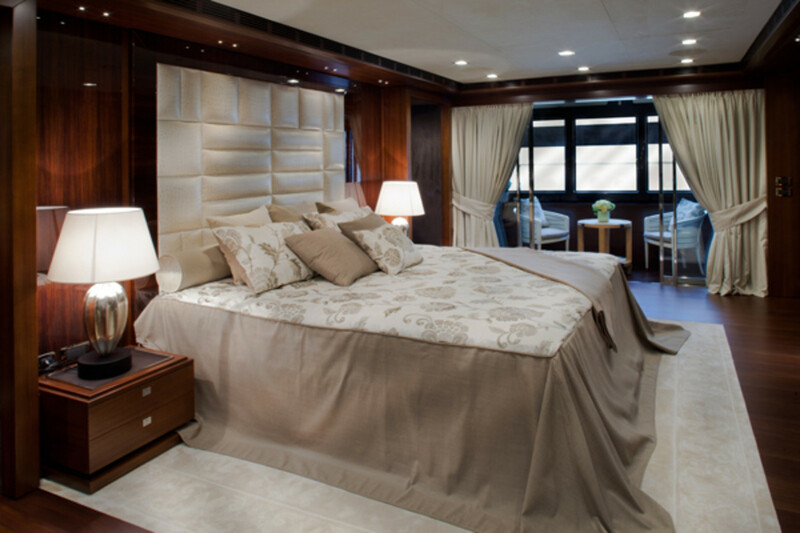 Ferretti wanted his designers to reflect his ideas of what a big yacht should be by incorporating an approach that combined novelty and strength, from both the stylistic and technical standpoints. Studio Zuccon, Ferretti Group’s historical partner, was chosen to develop the project. Through long and fruitful brainstorming sessions, Gianni Zuccon and his team evolved what became one of the most significant projects in CRN’s 50-year history. 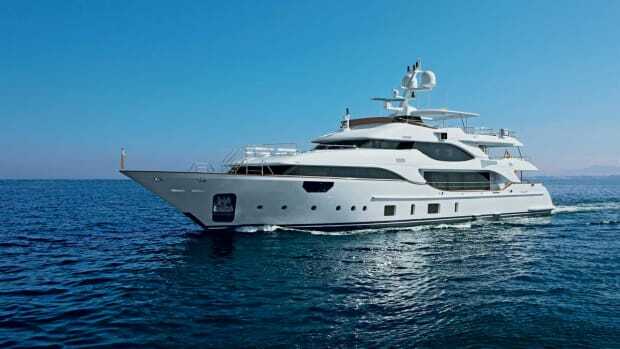 The subsequent development of the yacht was not disrupted by Ferretti’s decision to sell the project to the yacht’s current owner, or when the Ferretti Group’s ownership was transferred to the Chinese industrial conglomerate Weichai in 2012. The yacht has already set new standards for CRN in terms of her seaworthiness, strength and the refinement of her interior. 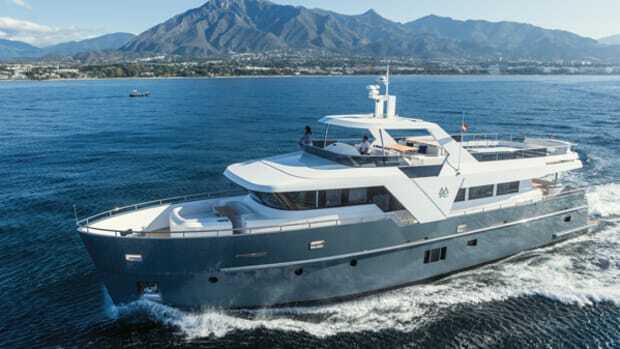 Her design, engineering, systems and equipment provide a clue to the wider self-renewal project that CRN, the Ferretti Group’s custom yacht division, has recently inaugurated. With J’Ade, Gianni Zuccon and his team took the opportunity to break with the overarching scheme and style that has guided the design of most CRN yachts during the past decade. The previous approach had provided CRN with a consistent style, which made every vessel recognizable at first sight. By adopting a fresh approach, Zuccon has expressed his commitment to developing new design languages. J’Ade’s hull and superstructure display an unusual shape as they are connected by a trapeze element that goes upward from the hull to the upper deck, encompassing five big floor-to-ceiling windows. 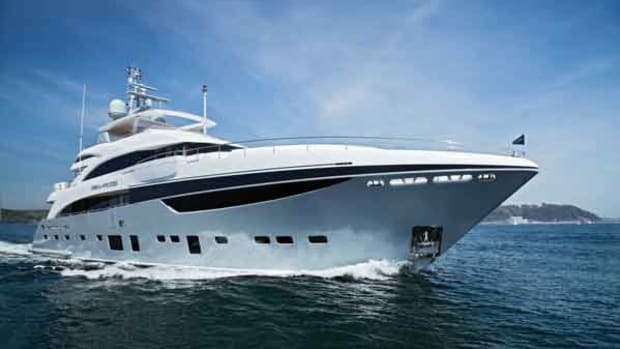 Zuccon added to the exterior design a distinctive feature to enhance the dynamic, flowing longitudinal lines giving the yacht a sleek profile, despite her imposing size. It is a sort of overhanging band wrapping around the wheelhouse and gently streaming aft encompassing the two bridge wings. 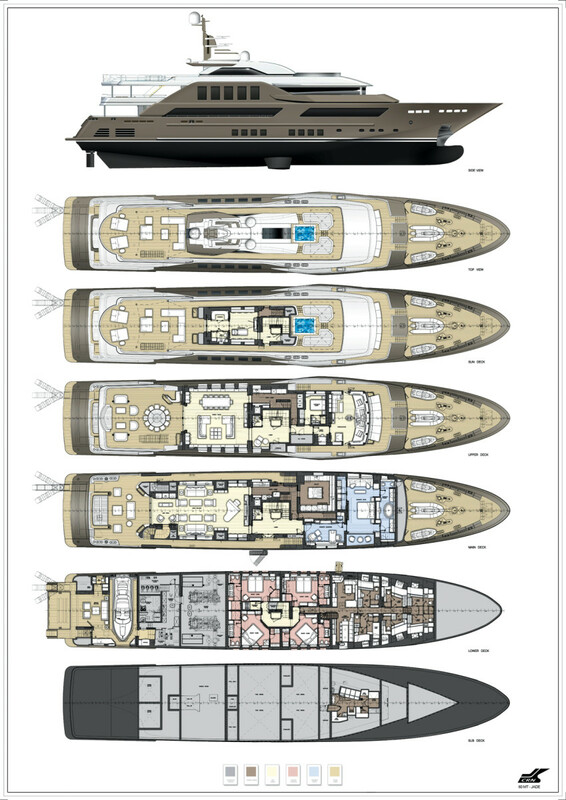 The white superstructure of the upper deck emerges from the compact body, both in the foresection and the stern. The widebody configuration of the upper deck enhances the vigorous look of the whole composition and, at the same time, offers generous volume to an open-plan upper salon with slightly inward-sloping walls. The floor-to-ceiling windows of the upper deck are a key stylistic feature that grew in size from the first sketches to the final project. They were pivotal to the whole concept and mark strongly the yacht’s imposing bulwarks. 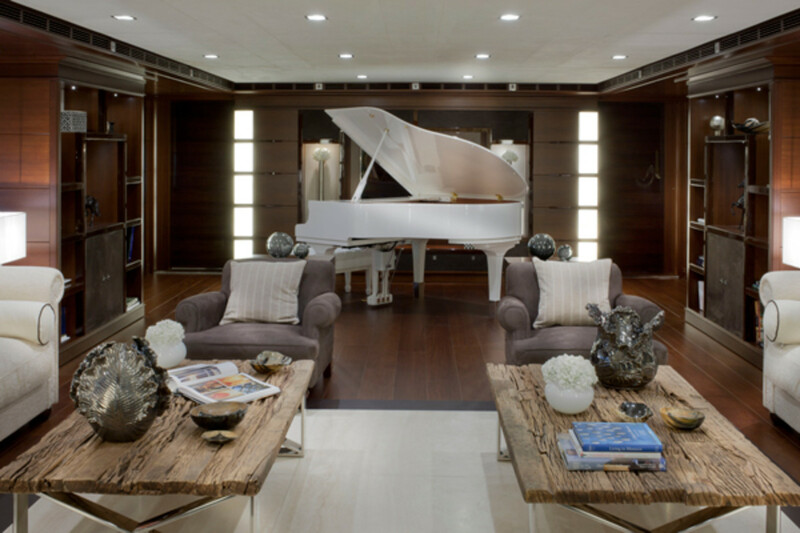 The yacht displays a traditional interior layout with ample space dedicated to social life, both inside and out. Five comfortable cabins accommodate 10 guests, including the owners. All are pampered by 13 crew. The interior decoration was envisioned by the owner’s wife, developed by Zuccon International Project, and then entrusted to the care of architect Costanza Pazzi, CRN’s interior decoration manager. The owner’s wife personally chose the elegant Loro Piana custom-printed leathers and fabrics, as well as the furniture pieces by Fendi Casa, Baxter and Poltrona Frau. The result is a refined, warm and original décor based on a two-color scheme. Although the predominant color combination is brown and off-white, what really makes a difference is the very clever use of the jade color in the décor and furnishings. A nonchalant glint of jade is scattered here and there. A cushion, a throw or a small armchair lend vivacity to a relaxing corner. Two of the 10 chairs surrounding the table in the formal dining room on the upper deck stand out for their brilliant jade-green upholstery. Again it is the green color that enlightens the sundeck’s wellness area. Both the hammam and the bathroom are covered with shiny green mosaic Bisazza tiles. This selective use of color ensured that what could have been an austere interior is in fact both warm and welcoming, giving J’Ade’s interior considerable character. 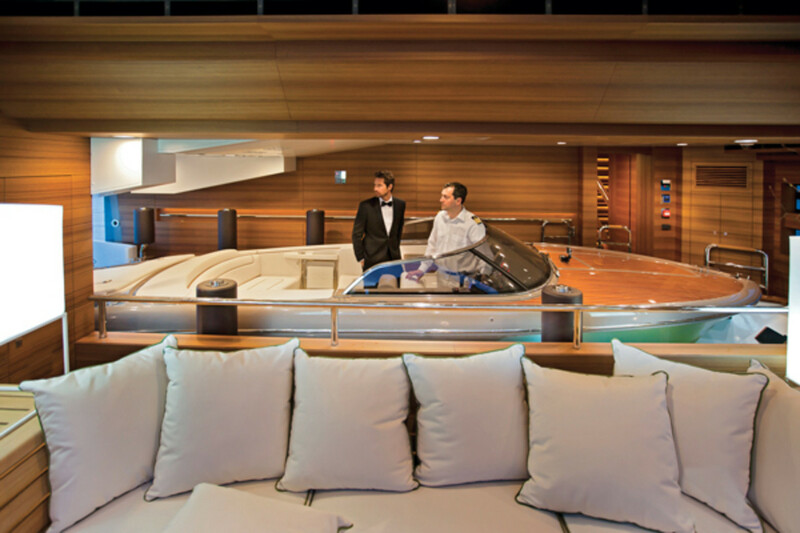 The constant relationship between indoor and outdoor areas is the element that identifies the yacht’s spirit. Inside and outside spaces flow seamlessly from one to the other. 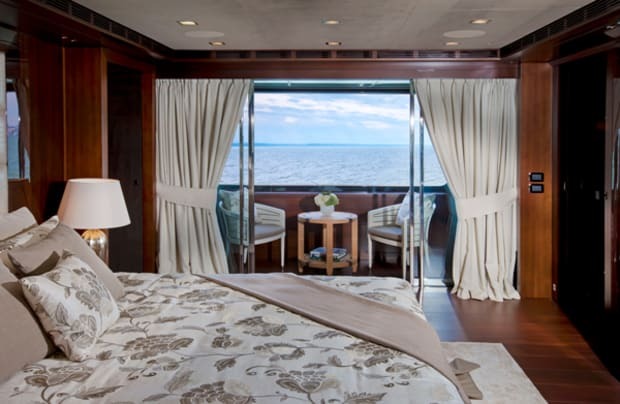 The generous openings on each deck have ensured that the interior environment is inundated with natural light and also affords excellent views of both sea and landscapes. 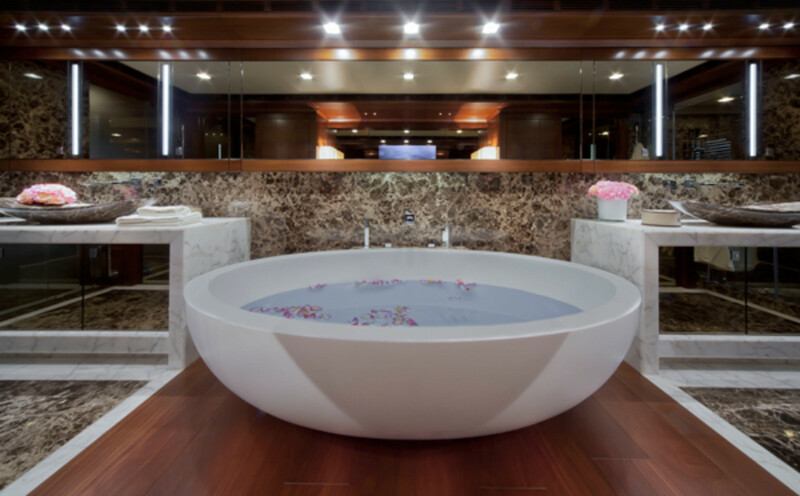 The utmost care went into decorating outside spaces, which feature furniture comparable to that used inside. When at anchor, the place to enjoy the sea and sights is the beach club. Fold the large stern door down and the garage area turns into a comfortable 700-square-foot lounging area, a great spot where one can relax after an invigorating swim, watch the sunset or sip an aperitif. The continuity between inner spaces and the open sea finds its quintessence in one of the yacht’s most distinctive features: its floodable garage, which is home to a tender. And what a tender it is: a shiny, teak-decked Riva Iseo 27. The transverse, float-in tender dock takes up almost the entire cross section of the hull and contains around 5,000 gallons of water that, for safety reasons, can be pumped out in less than three minutes. To add drama to the relaxing atmosphere of the whole beach club/garage area, the dock is equipped with green underwater lights. 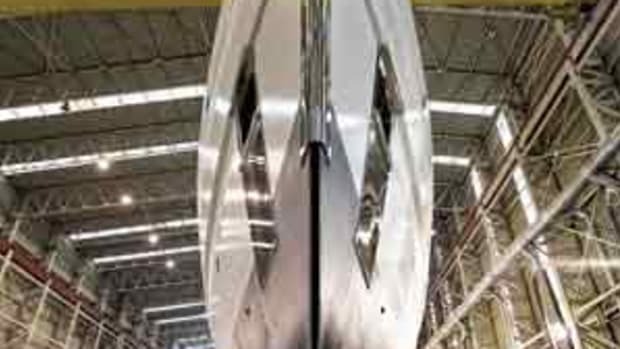 Engineer Simone Lorenzano, J’Ade’s project manager, explains that to achieve the floodable garage, the yard’s engineers had to introduce important structural modifications to the naval platform normally used by CRN for its 60-meter (197-foot) yachts. 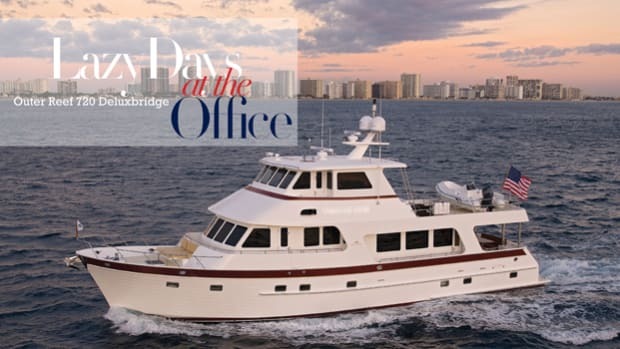 Although the weight of 5,000 gallons of water is small when compared to the yacht’s 775-ton displacement, a specific study of the floodable compartment’s effect on the ship’s trim had to be made to meet the classification requirements. Before the guests can board the tender, the shell door to port has to open, letting the seawater in and thereby enabling the Riva Iseo 27 to rise off its cradle. It is kept in place by fender poles. The operation takes around 10 to 15 minutes. Once the garage is full, the two wave doors protecting the tender and its passengers eventually open and the tender can shove off. This year has been a productive one for CRN. 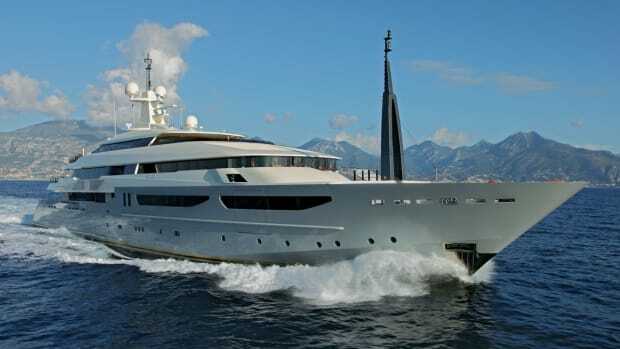 The launch of J’Ade was followed quickly by the yard’s largest build to date, the 80-meter (262-foot) Chopi Chopi, and then by the eighth yacht in its 43-meter series. 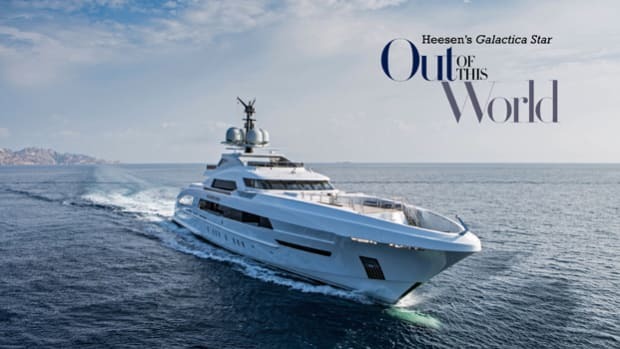 Under construction is a 73-meter (240-footer) designed by Omega Architects, a 60-meter (197-footer) by Francesco Paszkowski and a 74-meter (243-footer) by Zuccon International Project. The J’Ade project was a significant challenge in design and engineering, but with her completion, CRN displayed its undisputed maturity.